Three promising horses to represent the stable at Wangaratta on Thursday. Chapada and The Delphi are in race one, the open Maiden Plate over 1590m with Jordan Childs aboard The Delphi and Patrick Moloney on Chapada. It is the second run this campaign for The Delphi, which finished fifth over 1400m at Sale first-up on September 9. “He’s drawn nicely end even though he’s had a little while between runs I do believe he is fit enough,” Moroney said. “I think he’s more a 2000m plus sort but with the advantage of the draw we should get a nice run nearer the speed. It is the third start for Chapada (pictured), the son of Bullet Train a somewhat unlucky fifth at Geelong last time out on September 2 following an excellent debut in the city at Sandown. “He’ll jump from barrier 10 which is not ideal but we’re really happy with the horse,” Moroney said. “The wide draw might not be a huge disadvantage as he’s drawn in at both his starts and ended up unlucky but ideally we don’t want to be caught wide. 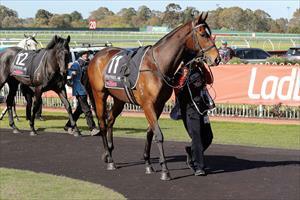 Do You Reckon runs in race four, the open Maiden Plate over 1300m with Patrick Moloney to ride from barrier two. The son of So You Think pleased Moroney with his debut third over 1217m at Moe on September 11. “He’s trained on nicely since his good effort on debut,” Moroney. “He’s drawn nicely so if he flies the gates he can lead but if he’s going to be taken on we’ll ask Patrick to try and take a position.